Ireland has had a president since 1938, and today is the 14th presidential election in that time. Almost certainly, the winner will be the incumbent, Michael D. Higgins, aged 77, poet, former sociology lecturer, former Minister for Arts, Culture and the Gaeltacht, former Mayor of Galway, genial left-wing icon. 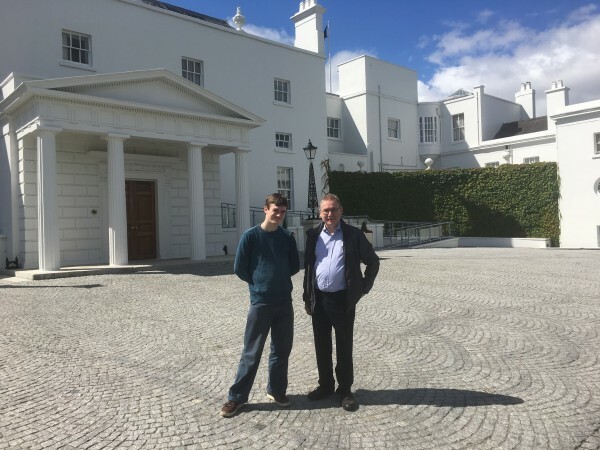 Young F and I were lucky enough to visit Áras an Uachtaráin, the President's official residence in Phoenix Park, last summer. It's a remarkable place, and the current resident is a remarkable person. SF fans should note that President Higgins sent a special welcome note to next year's Worldcon, which will be held in Ireland, here read out at Worldcon 76 by Dublin 2019 Chair James Bacon. Of the 14 elections, six have been uncontested. In three cases (Sean T. O'Kelly in 1952, Patrick Hillery in 1983 and Mary McAleese in 2004), an established incumbent sought re-election and nobody could be bothered to oppose them. In the other three cases (Douglas Hyde in 1938, Cearbhall Ó Dálaigh in 1974 and Patrick Hillery in 1976) the major political parties agreed on a candidate in unusual circumstances (the first president of the lot, and resolving the two curtailed presidencies of the 1970s). If there is an election, there are three ways you can become a candidate. If you happen to be the incumbent president, you can nominate yourself for a second seven-year term. (You are only allowed two terms.) This is what happened in the three cases of 1952, 1983 and 2004. (Éamon de Valera could have nominated himself in 1966, but chose to take a different path.) The current President, Michael D. Higgins, has also nominated himself for re-election. 2018 is the first time that a self-nominated president's re-election has been contested. If you can persuade 20 members of either house of the Irish Parliament (the Oireachtas) to nominate you, you can also qualify as a candidate. The Dáil (lower house) currently has 158 members, though under the current constitution its size has varied from 138 to 166; it must have at least one member per 30,000 of the population, and at most one member per 20,000. The Seanad (upper house) has 60 members, fixed in the constitution. So to go the parliamentary route you need around 9-10% of parliamentarians to back you, which in practice means at least one medium-to-large political party, or several small ones. All of the candidates in the 1938, 1945, 1959, 1966, 1973, 1974, 1976 and 1990 elections were nominated by this route (including the uncontested elections of 1938, 1974 and 1976). The third path to nomination is to get at least four county councils to propose you. Until 1997, this had always been thought to be a poor relation of the Oireachtas route. County councillors are also members of political parties, and councils don't have a lot of power. However, in 1997 there was some dissatisfaction in the main political parties about the way their candidates had been chosen, and two outsiders (a former Eurovision winner and a retired senior policeman) successfully appealed to local government to broaden the field. This established a degree of independence for the councils which hadn't been there before. The councils nominated two out of five candidates in 1997, four out of seven in 2011 and four out of six this year, a record proportion. Normally candidates nominated by the councils are non-party, though last time round one of them was regarded as being close to Fianna Fáil. Today's election is very unusual. As noted above, it is the first time that a self-nominted incumbent has faced opposition. It has the highest ever proportion of candidates nominated by county councils. The only candidate nominated by Oireachtas members is a representative of Sinn Féin, the two larger parties having decided to support the incumbent. And it also looks like it will deliver the highest ever winning margin for a successful candidate. The other four have been multi-candidate affairs, with nobody winning more than 50% of the first preference votes on the first round. Like all other Irish elections, the presidential election uses the single transferable vote, with voters numbering the candidates in order of preference. If no candidate has more than half of the votes, the candidate (or candidates) with fewest votes is eliminated and their votes transferred to their next preference, until someone has a majority of all remaining valid votes. That delivered victory for Sean T. O'Kelly in 1945 (he was only a hair's breadth below 50% on the first count), Mary Robinson in 1990 (the only case of a candidate who did not get the most first preference votes winning on transfers), Mary McAleese in 1997 and Michael D. Higgins in 2011. Robinson and Higgins are the only two official Labour candidates to have won the presidency so far. O'Kelly and McAleese were explicitly Fianna Fáil candidates. Fine Gael have never won a presidential election. The polls look very good for President Higgins. His percentage is consistently in the high 60's. This is even better than Finland's president Sauli Niinistö, who got 62.7% against seven opponents in January this year. Although elected as the Labour Party candidate last time, he is running this time as an independent, effectively with backing from Fine Gael as well as Labour. The strongest criticism made of him during the campaign has been that he had originally said he would serve only one term. However, I think people are entitled to change their minds. The other five candidates are remarkably weak, in my subjective view. The only Oireachtas-nominated candidate is Liadh Ní Riada, a Sinn Féin MEP for the southern part of Ireland. She has not previously been one of their most visible figures. Three of the other four, and I am not making this up, are businessmen who were nominated by county councils after becoming well known through their appearances on the Irish version of the reality TV show Dragon's Den. (Shark Tank in the United States.) The last is a mental health activist; she and Ní Riada are the two women among the six candidates. As the polls currently sit, Sean Gallagher, one of the Dragon's Den candidates who was in fact the runner-up in the 2011 election, is in second place, but a very long way behind at roughly 11%. Candidates can get up to €200,000 of their election expenses reimbursed if they have more than 12.5% of the vote when they are eliminated. None apart from President Higgins seems likely to pass this threshold. The reasoning behind it is rather technical, but the basic argument is that Ireland does not have an established religion to blaspheme against, and that the law has anyway never been used. Polls suggest that it will be carried by a large margin. Results should be out by tomorrow afternoon, Irish time. I hope they're also voting to remove the comma, or they'd have to have a second, even odder, referendum. My main awareness of the election is through people on twitter urging one another not to take Michael D Higgins' re-election for granted and get out and vote- hope i'ts worked!